There are many artists that visit the World’s Tallest Water Sphere site. They make beautiful photographs, computer images, and artwork and contribute it to the site for all the world to see. Most of us gaze in awe at the wonderful creations they make that inspire us and give us hope for humankind, just as did the original inception, development, and construction of the World’s Tallest Water Sphere. Hooray for fresh clean drinking water at acceptable water pressure levels! Hooray for inspiring artists! This article will teach other visitors how to create other similar artistic images. Click on any image for a larger view. By following the simple guidelines, perhaps printing off a few of the images as a staring point, everyone can create inspiring works of art based on the World’s Tallest Water Sphere. Use this photo or any other photo from this site as a model. Or visit the WTWS in person and create a new image. Inspire others as you inspire yourself. To begin, grab some artistic tools. You will need some paper and pencils, fabric and ink pens, canvas and paints, paper and scissors, or other art media. For this exercise, I used paper and some color pencils I bought at the corner drug store. The first step is to make a general outline shape of the WTWS. The top is sphere and likely will be the focal point of your drawing. 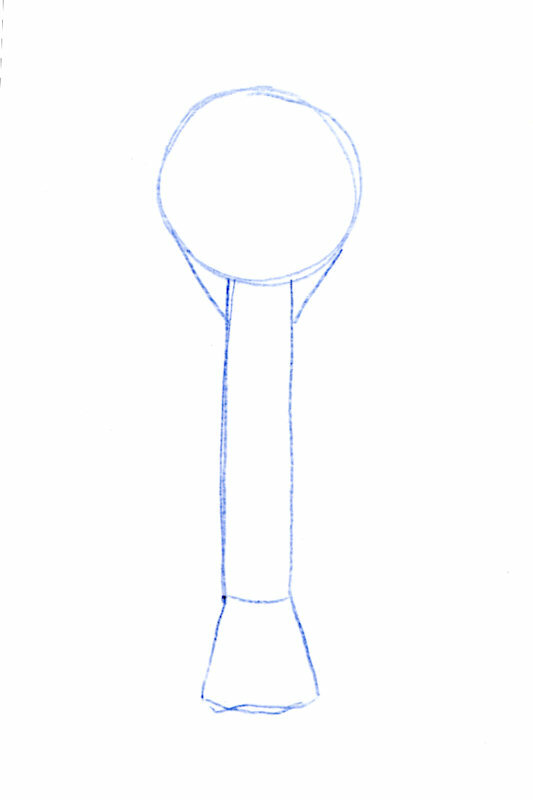 Then draw the neck, a column leading from the sphere to the ground. The bottom of the WTWS has a conical support base. Underneath the top there is also a bit of a cone to support the crowning sphere. This drawing shows the beginning of my artwork. The next step is to color in your water sphere with the basic colors. You can use authentic color schemes, try some new colors to propose to Union residents, or make any colors to free your mind. There are no right or wrong colors. The actual colors change with the seasons and the day to night lighting. Your perception of the colors change with your mood and your feelings. Feel free to experiment. Consider where the light source is in your image. Since the WTWS is shiny, the side of the WTWS nearest the light probably is the lightest color. The side away from the light is probably the darkest color. Add shading colors to the dark side of the sphere. Here my drawing is slightly blue turquoise. 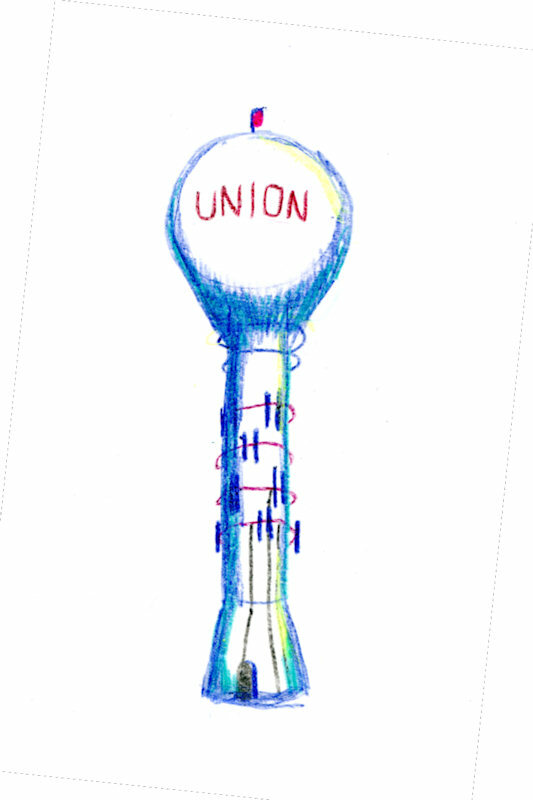 I have also adding the proud Union lettering that announces to all the world the fine people who have conceived and built this inspiration. 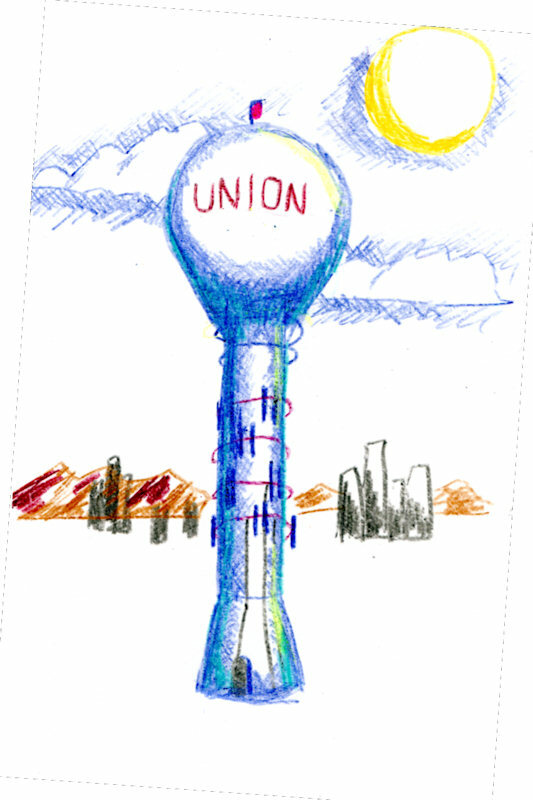 Don’t forget the day-to-day function of the World’s Tallest Water Sphere. 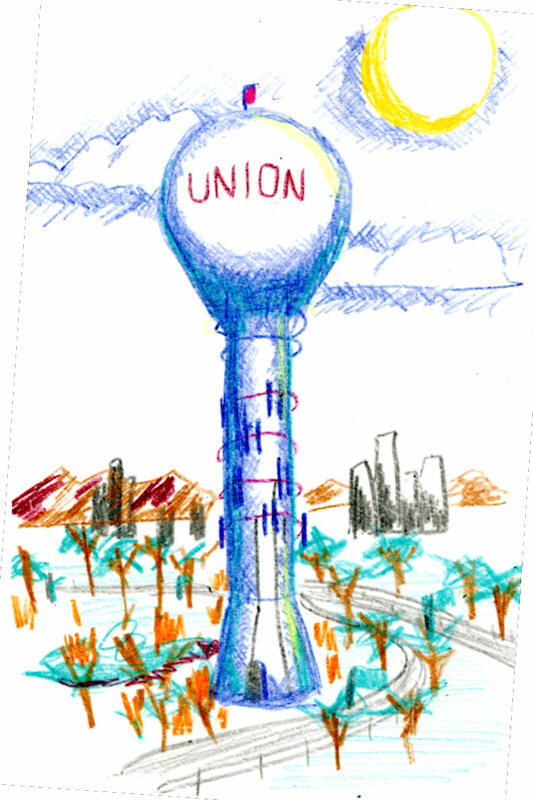 Not only does it provide water, it also serves as a calling card for the Township of Union. It functions as a cell phone tower for millions of mobile phone calls per month. And it acts as a navigation point both in the day and, now with its new red beacon, during the darkest nightmare-filled nights. When you are afraid of the dark and the monsters that roam within your deepest dreams, the WTWS with its flashing beacon will be there. Add some of the modern features to your WTWS image. This drawing now contains the cell phone antennas, maintenance wires and doorways, and the red flashing top beacon. Also, since the beginning, the WTWS has had two upper neck halos. Some say these halos are for maintenance. 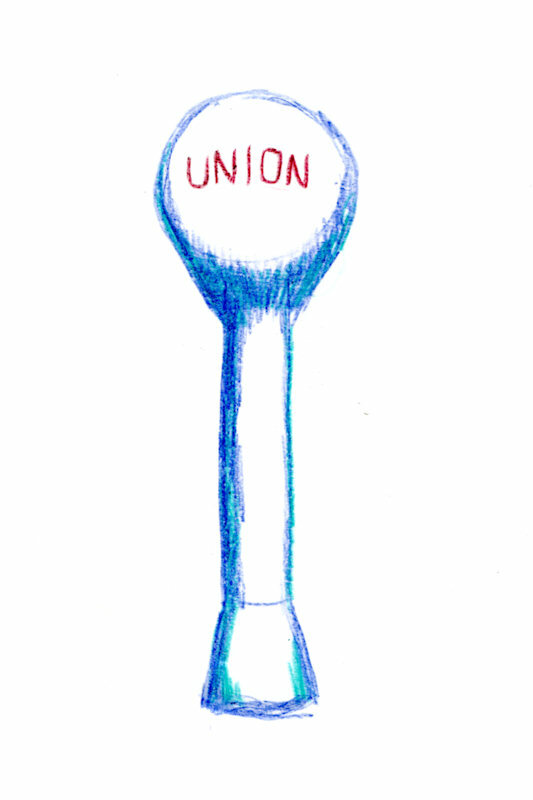 Other say these broadcast the message that all Union residents must follow. Now that you have the main WTWS image created, you can add some surrounding context. Start with some background and work your way forward. When considering the background, ask yourself some questions. Is it day or night? Do I see the sun or the moon, blue skies or a black velvet field of stars? Is it clear or cloudy and stormy with lightning? Don’t forget the backdrop on the ground either. To the west are the Watchung mountains of New Jersey. 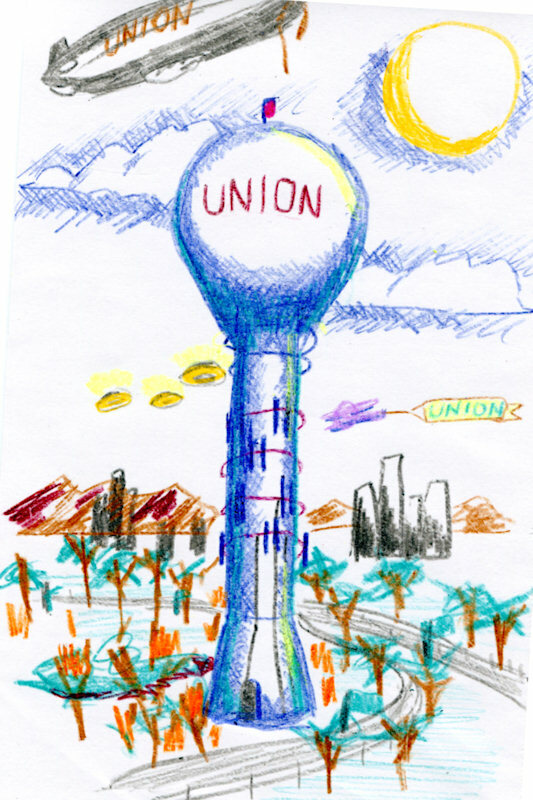 To the east are the cityscapes of Union, Newark, and New York City. Being near Newark Liberty airport, there might be a few airplanes as well. 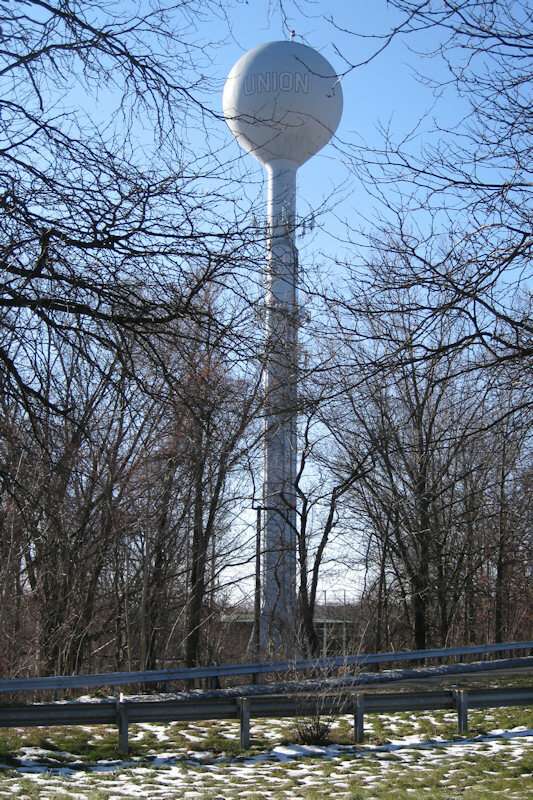 Perhaps there are some nearby inferior water towers gazing up in awe or effluvial envy of the WTWS. For my drawing I made a sunny day with some cities and mountains in the background. Now that a background is added, work your way forward and add some foreground. Remember all the rich details of the site of the WTWS. It sits in the Kahwamee swamp, so add a swamp and some cattails. It is surrounded by major roadways, so don’t forget Route 22, the Garden State Parkway, or Morris Avenue. Finally, add some grass and trees. Although many people have an image of New Jersey as an endless roadway, in reality it is a garden state, covered from end to end with grass, trees, and water ways, so don’t leave them out Consider which season you have in your image, and make the trees bare for winter, bright green for spring, dark green for summer, and fire-colored for autumn. Go crazy with the colors because the WTWS site changes with each passing day. I would say our artwork is looking great, but as a finishing touch you can add all sorts of happy visitors to the WTWS. I remember when I was a child, a large zeppelin attempted to dock with the WTWS during a storm. There was also an episode of belligerent alien space craft who communicated with the WTWS and then left in a peaceful manner (and as a gift gave us large brown bubbles on our New Jersey thin-crust pizza). Also there are countless episode of cars crashing and planes doing aerial stunts around the WTWS. Perhaps you want to add your family or pets to the artwork. This is the time to let your imagination run wild and give your drawing a sense of personality. I hope I’ve given you a bit of inspiration to make some WTWS artwork. Click on the images to get a larger view. Feel free to use any of these images as starting point or as a coloring book for the beginning artists. If you make any good artworks, please send them in, and we will feature them on the site. Good luck! This entry was posted on Friday, July 3rd, 2009 at 8:13 pm	and is filed under Art, Fun Facts. You can follow any responses to this entry through the RSS 2.0 feed. Both comments and pings are currently closed.